We were very confident in the options ideas we formulated for BBRY in yesterday’s premarket report, which were the BBRY Weekly $9.50 & $10 Calls. We pointed to the company’s convincing earnings beat as being the reason we felt a solid move was in order, despite the fact that it had just been hanging around the $9 area without a lot of volatility for the preceding few weeks. 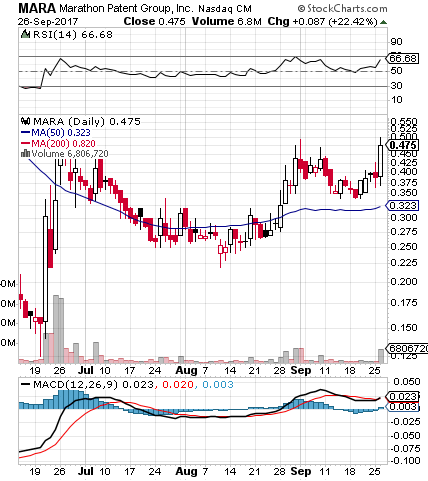 A solid move is exactly what we got, with BBRY stock running from 9.78 to 10.83 on the day. That facilitated some fantastic gain opportunities for anyone who was following along with our ideas, which both produced multi-bag intraday upswings. The $9.50 Calls traded in a range from .37-1.26 for a gain of 240%, while the $10′s ripped extremely hard from a low of .12 all the way up to .76. That worked out to an increase of 533% marking the second consecutive week where we’ve alerted on an options idea and seen a single-session gain of over 500% (KMX, last Friday). Important Note: Never trade options with a weekly expiration on a Friday unless you’re an expert trader with disposable funds. It’s extremely risky. 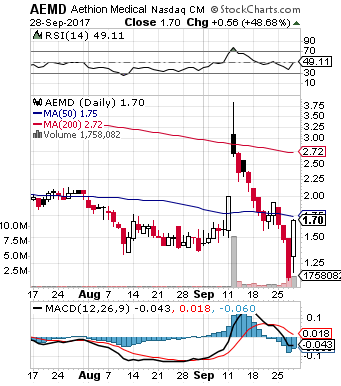 The other top performer from yesterday’s premarket newsletter was AEMD, which, as you can see from the included chart snapshot, we alerted at the absolute perfect time. The stock had practically been in free-fall over the past couple of weeks, and we signaled the bottom with precision. It traded in a range from 1.18 to 1.70, for a respectable intraday increase of 44% and closed at the high of day. This is a stock that was trading at nearly $4 just this month, and now we’re going to be monitoring to see how much of that ground it can recapture on the rebound. We’ll look for it to establish higher highs and higher lows. If it can manage to crack through the channel between the current 50DMA of 1.75 and September 11th’s swing high of 2.00, things could once again get very interesting for AEMD. We’re now mentioning the calls we made for the Apple options chain on Tuesday for the third consecutive day, after each of our tracked contracts yet again set new highs during yesterday’s session. To refresh your memory, we slated the AAPL Weekly $150-155 Calls for observation in Tuesday’s premarket report, and they provided solid gain opportunities ranging from 78-146% that day. Here are the updated figures showing the lows from Tuesday, to the new highs attained yesterday. $152.50 Calls – Range: 1.00-2.55 – Max Gain: 155%. While we’re on roll with options calls, we might as well let it ride by selecting a couple of other ideas that are worth monitoring. Tiffany & Co. TIF - Tiffany’s chart is showing a decent bottom setup, while some insider buying was reported this week near 4-month lows. We’re going to highlight the TIF 10/20 $92-93 Calls and keep them on our radars in the days and weeks ahead. Blackberry Ltd. BBRY - For a more short-term idea, we’re going to signal the BBRY Weekly $9.50 & $10 Calls on the heels of Blackberry’s premarket earning beat. Prior to today, the stock has hovering around a solid level of support at roughly $9 for quite some time, but today’s release could definitely have a positive effect on the chart. The company posted a beat on profits and revenue, while software sales set company records.